This is not going to be a formal build review. Build reviews have already been written about this model, which clearly outline the kit's strengths and its issues, so there is no reason to revisit those. The kit is also no longer available. 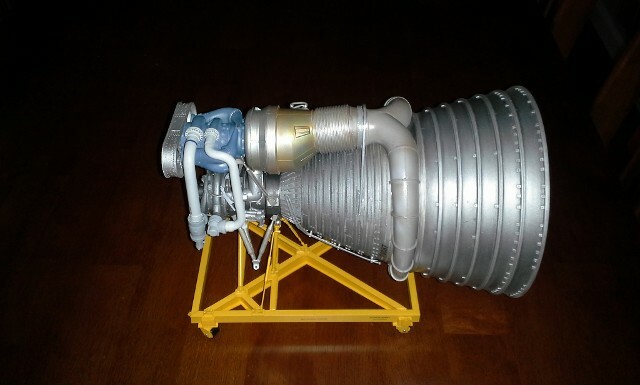 I was informed by Jim Key of Custom Replicas, parent company of Accurate Models, that they simply saw no solid economical reason to continue producing the kit. 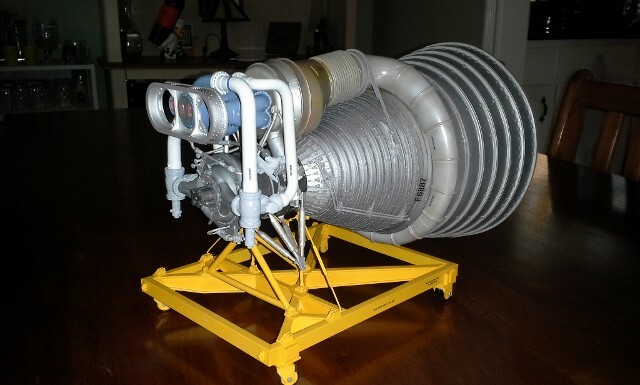 Even with the Jeff Bezoz (Amazon.com CEO) efforts to recover Apollo 11 F1 engines from the Atlantic Ocean, the demand for the kit has been steadily declining. Figures, right about the time I decide to buy one, they stop making it. However, Jim did tell me that there was one copy of the kit still unsold, but incomplete. 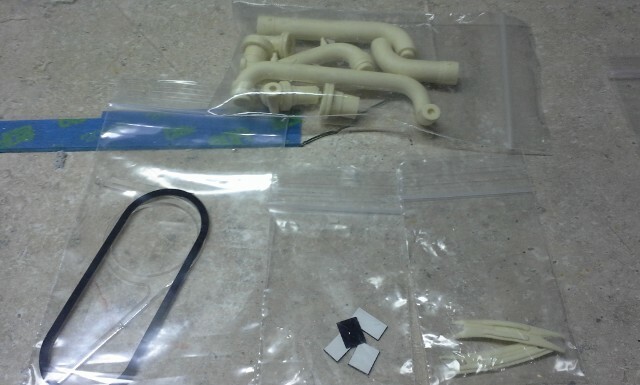 Once the last "white metal" parts were provided by the molder, that kit could be sold. So, here it was. The last copy of the Accurate F-1. The model is truly a "mixed media" product, including many resin parts, pressure cast "white metal" parts, extruded plastic parts, laser-cut acrylic parts and decals. 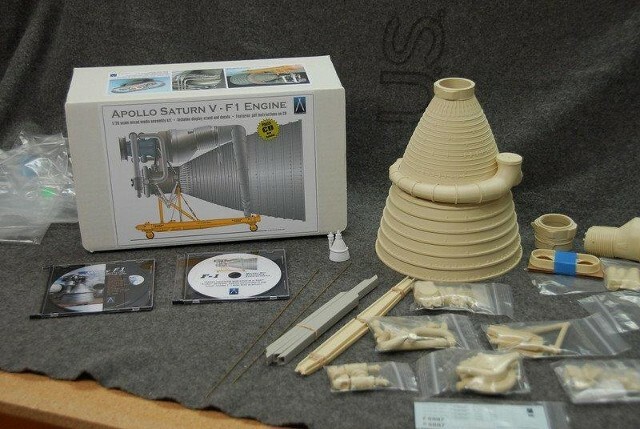 It comes with two CD-ROMs - one containing the PDF instructions for the model and the other contains a set of various high-res photos of F-1s on display at various locations. many of which, I have also photographed over the years. 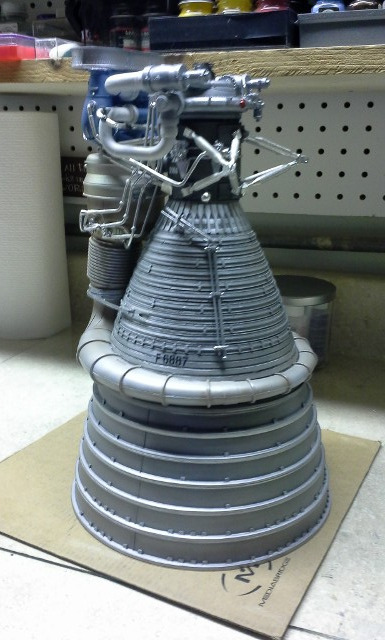 This model now represented one of the last components for "The Apollo Room's" display of Apollo-era related models. 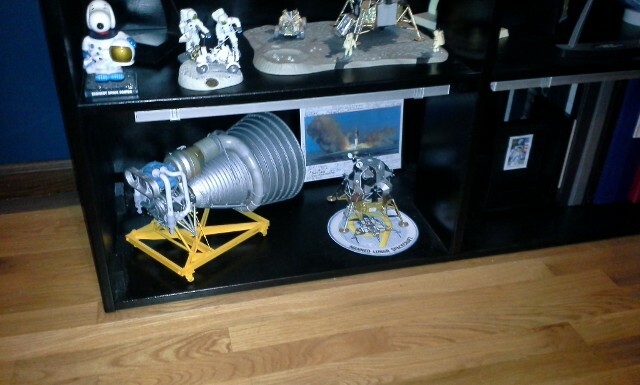 Although I now wish I had purchased one of these sooner, it's here now and after a number of weeks of involved construction, stuffed in the midst of painting the living room & dining room of our home, the F-1 is now on display in "The Apollo Room" main display shelf complex. Here are some shots of the F-1 during construction. 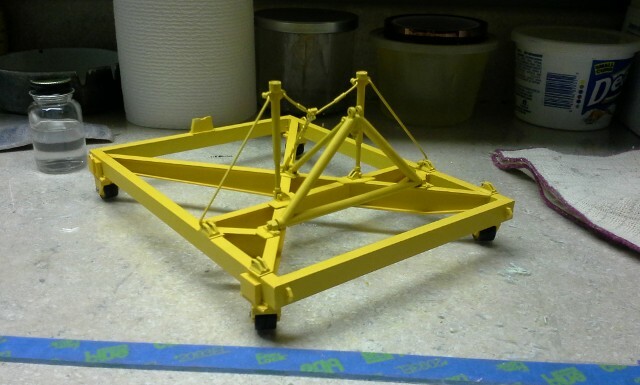 The first thing that comes out of the build effort is the transport carrier for the engine. 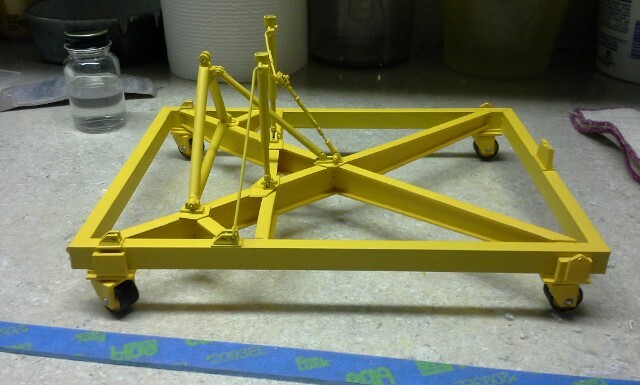 It's an accurate representation of the carrier used to support F-1s during assembly and movement to the booster assembly area. 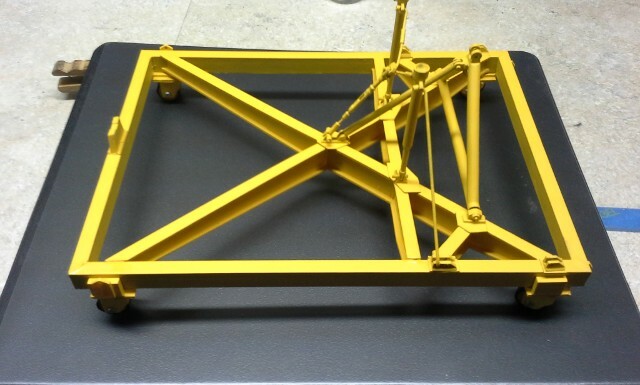 There is an extensive use of Testor's Metallizer lacquer paints, which create a very realistic metallic surface. 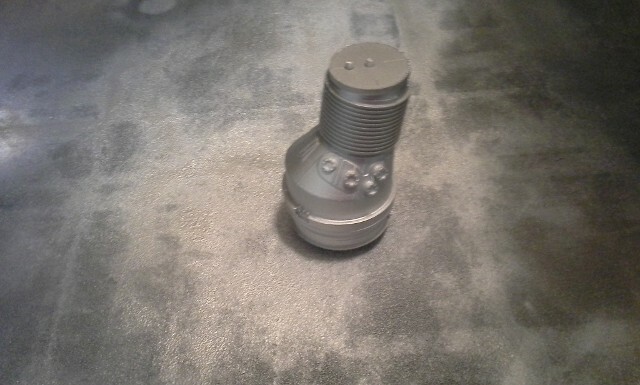 The main combustion chamber and turbine inlet attachment skirt after initial assembly and coating with Metallizers. 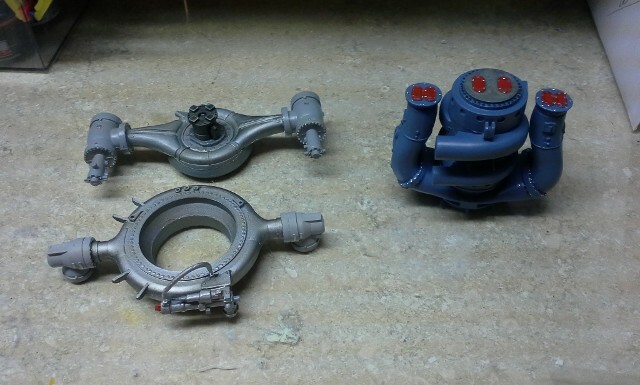 The fuel manifold, the LOX manifold and turbo-pump assemblies after their initial coating and detailing. The turbine exhaust heat exchanger, just after initial aluminum plate coating. 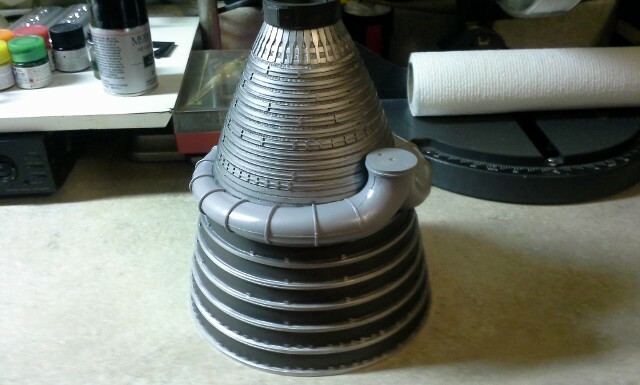 The engine bell and skirt, joined together after separate coating and detailing were done. 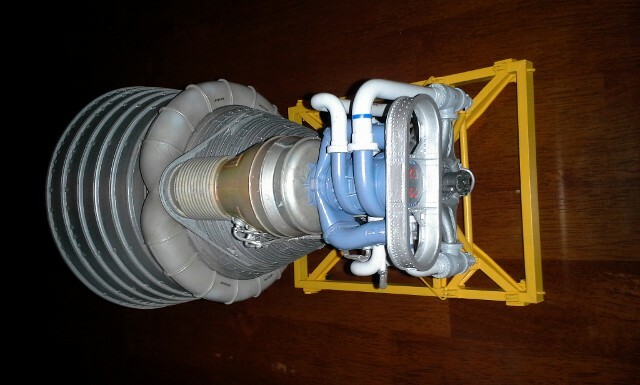 The turbine exhaust manifold is also located on the joint between the bell & skirt. It was coated with a mix of aluminum and flat white. This shows the heat exchanger located onto the exhaust manifold, after detail painting. 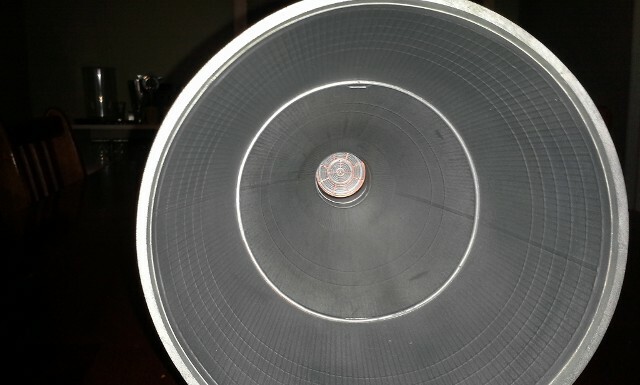 This step included the ring strap which is used to support the turbine/heat exchanger assembly. Successive fine coats of clear yellow, clear blue and clear red were used over a clear smoke & burnt metal base mist, in order to give the assembly a heat-distressed look. 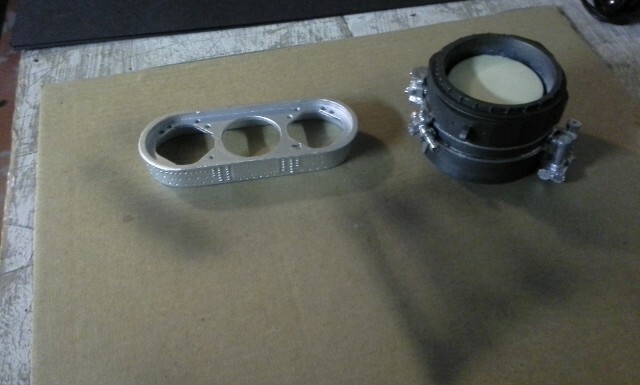 This is a shot taken after the integration of the gimbal forks onto the body of the combustion chamber. The purge lines can be seen running along the sides of the engine bell, all of the main feed lines are running to and from the pump complex and all of the heat exchanger bleed lines are in place. This is very near completion. 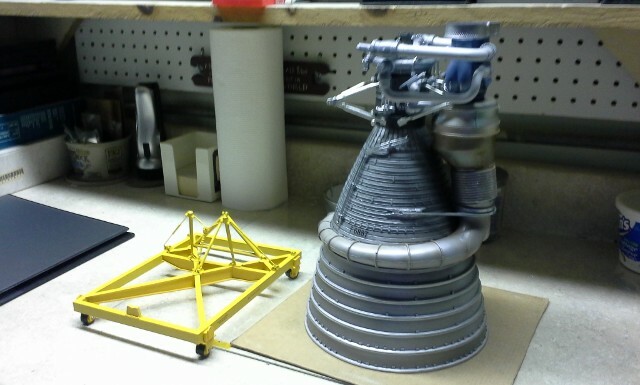 The completed engine model is sitting next to its carrier. Here is a series of photos of the completed F-1 resting on its transport carrier. 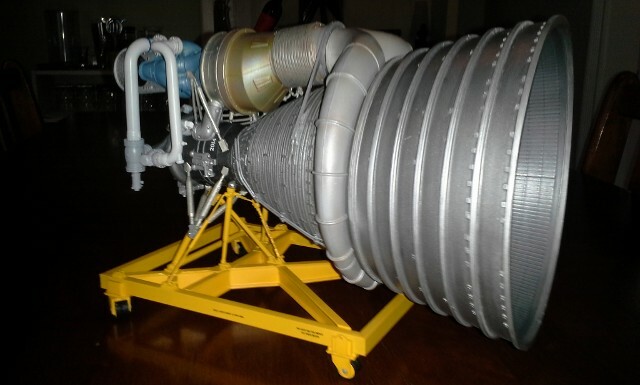 The new F-1 is very near the model of its host, the Apollo/Saturn V Rocket. 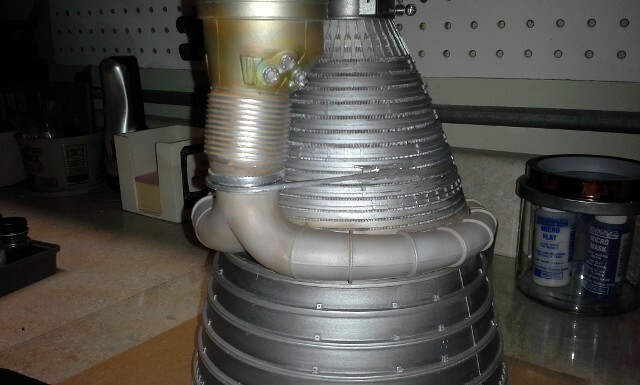 There were five Rocketdyne F-1s used to power the Boeing's S1-C first stage and push the entire load of the Moon rocket off the pad. 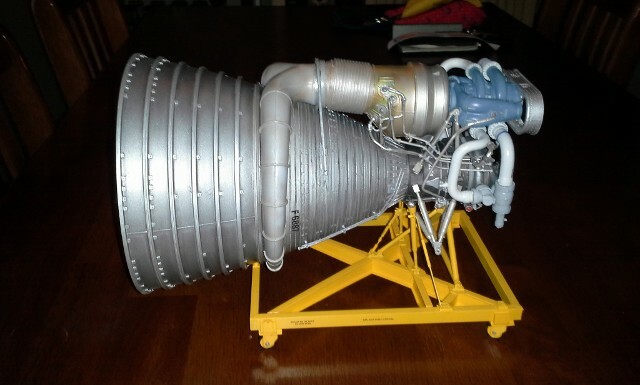 I would like to thank Mr. Jim Key of Accurate Models & Custom Replicas for giving me the opportunity to purchase this last copy of the Accurate Models F-1 model. 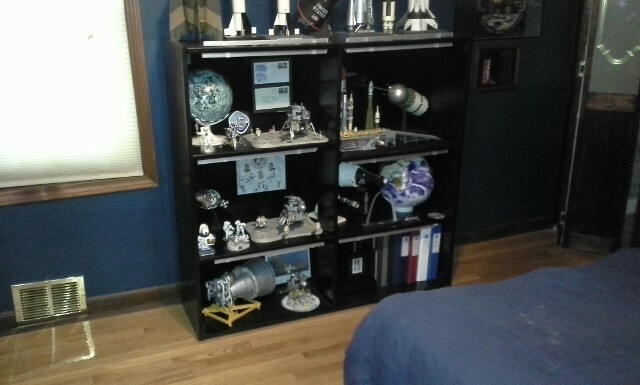 It is now part of the extensive display of Apollo spacecraft models gathered in "The Apollo Room."